Like hundreds of other residents of Patan's historic heart, Debendra Shrestha could have torn down his ancestral home and replaced it with a concrete highrise and earned lots of money renting out apartments. But the Shrestha family decided that their 18th century Malla-era home was too precious, so they collectively decided to restore it. They were looking for money when in 1997 the German aid agency GTZ came along to promote urban development through local initiatives. 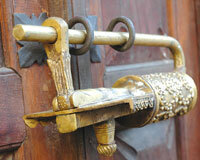 It was making an inventory of buildings that deserved to be preserved and the Shrestha household was included. The Department of Archaeology then secured support for restoration from UNESCO, which had in 1979 declared Patan Darbar Square one of the seven monument zones in the Kathmandu Valley World Heritage Site. UNESCO had been getting increasingly worried about urban sprawl eating away at the old buildings and of the Valley losing its architectural and cultural heritage. UNESCO worked with the Patan Tourism Development Organisation and found a unique formula to turn the restored private houses into bed and breakfast pensions. It took five years but the Shrestha's house was reborn on Wednesday as Newa Chen. Like Debendra, Uday Rajbhandari's ancestral home, which is adjacent to a 2,000-year-old Kirat-era excavation site, was also crumbling. 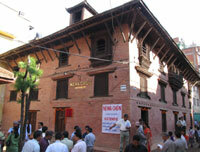 The Rajbhandari House was also inaugurated on Wednesday as a tourist inn. "Preservation of architecture is an integral part of Kathmandu Valley's culture which is under great threat from urbanisation," said UNESCO's Nepal representative, Koto Kano (pictured left at Newa Chen). "The Shrestha and Rajbhandri houses in Patan are models for rehabilitating traditional buildings and also how they can be sustainably preserved through tourism." The National Federation of UNESCO Associations of Japan raised money for the restoration of the two houses. The two inns have modern amenities, but keep the traditional ambience of Newari houses with their low ceilings, mortar and brick walls, warm subdued lighting and quiet courtyards. 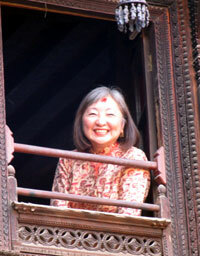 Newa Chen and The Rajbhandari House are open to tourists as well as long-term residents. But more than just preserving two houses, Debendra and Udaya both hope other old buildings in Patan can also be similarly restored. Kathmandu Valley heritage expert, Anil Chitrakar, says he is convinced the word will spread as the inns start making money. "The good thing is that it is not only bad things that are contagious in Nepal, good things are also contagious," he adds. 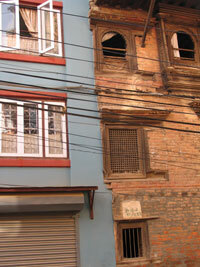 Indeed, the trend of bringing back the brickwork facades is spreading in Patan and Bhaktapur. The restoration of the two private houses shows that support is now available not just to restore temples and public buildings but also private houses of architectural importance. It also shows what can be achieved when local communities get together for a common cause. Says Dilendra Shrestha of the Patan Tourism Development Organisation: "In Kathmandu Valley the formula is: monuments minus the surrounding residential buildings equals no tourists. That is why it is important not just to preserve the temples and darbar squares but also the historic core of the towns." 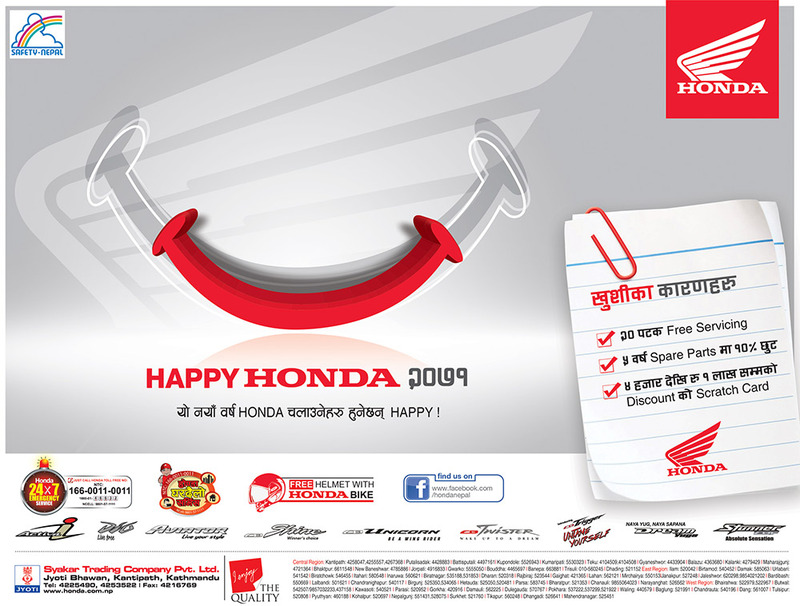 There are two kinds of restorations going on in Patan these days. The first is the tearing down of low, old buildings which are replaced by high rises with traditional brick facades. This trend has been encouraged by the municipality giving subsidies on construction material for buildings with historical looks. However, many of these buildings look disproportionately tall on the old skyline. A much more harmonious way is to restore the old buildings like the two inns, strengthening them structurally and keeping true to the original in dimension, looks and building materials. And a useful side benefit is to turn them into hotels so they earn their keep. Debendra's wife, Saraswoti, hopes that the tradition of restoring old homes will now spread. She adds: "This is not just an old house. This is who we are." The Shrestha House is located in Kulimha Tol on the ancient road leading from Patan Darbar Square down to the Bagmati at Sankhamul. It is built of brick and timber in the traditional Malla style with three wings around a sunny courtyard. The rooms have been functionally restored and are cosy-although tall guests must be warned not to get up suddenly or they will bump their heads on the ceiling. The suite and bedrooms are minimally stylish and are ideal for long-term guests. In Kwalakhu adjacent to an ancient Kirati religious site which is being excavated by the Department of Archaeology, the house is located in one of the squares within the Patan Monument Zone and has a courtyard and a garden. Rooms on three floors are accessed through elaborately carved wooden balconies. It is an oasis in the middle of bustling Patan, perfect for retreats for authors.